The September housing construction report from Census Bureau and HUD rebounded from the unusually low August level and returned to the slow but steady path expected. Total starts rose just above 1 million for the third time in 2014 to an annual level of 1,017,000. Single-family starts increased slightly to 646,000 establishing a third quarter average of 646,000, a 3.4 % increase over second quarter. Regionally, single-family starts were up in the Midwest and West and offset by smaller declines in the Northeast and South. Multifamily starts (units in buildings with two or more units) increased 16.7% to an annual rate of 371,000 and finishing the third quarter at an average of 378,000 up 5% from the second quarter. 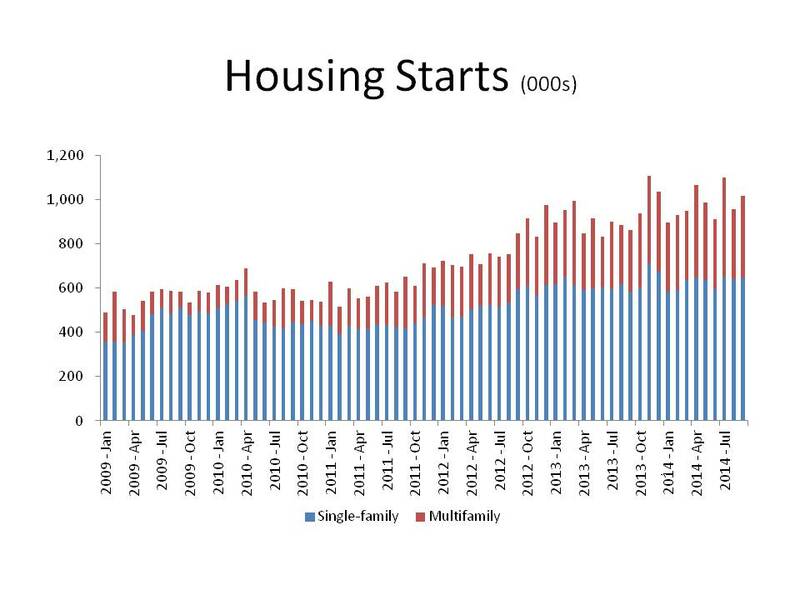 Multifamily starts were up in all regions but the Midwest where the August level was unusually high. Housing permits, an indication of future construction, were also up 1.5% and above 1 million for the seventh month in 2014. Single-family permits were virtually unchanged at 624,000 and 627,000 for the third quarter, up 2% from the second quarter. Multifamily permits were up 4.8% for the month to an annual level of 394,000 and 399,000 for the third quarter, which is virtually the same as the second quarter. The return to a range of just over 1 million starts was expected after an unusually low report in August as well as a return to a single-family range around 650,000 and multifamily close to 370,000. NAHB expects a continuation of this kind of modest increase to continue through 2014 but accelerate for single-family construction as employment rises and confidence in the housing market improves.